AEC Magazine reviews GRAITEC Advance Steel 2012®…. AEC Magazine is the UK’s number 1 journal for the Architecture, Engineering and Construction industries. AEC Magazine has a bold agenda that reflects the evolutionary nature of this fast-moving sector with its proliferation of software and hardware technologies and the collaborative working practices that are integral to today’s design and engineering workflow. 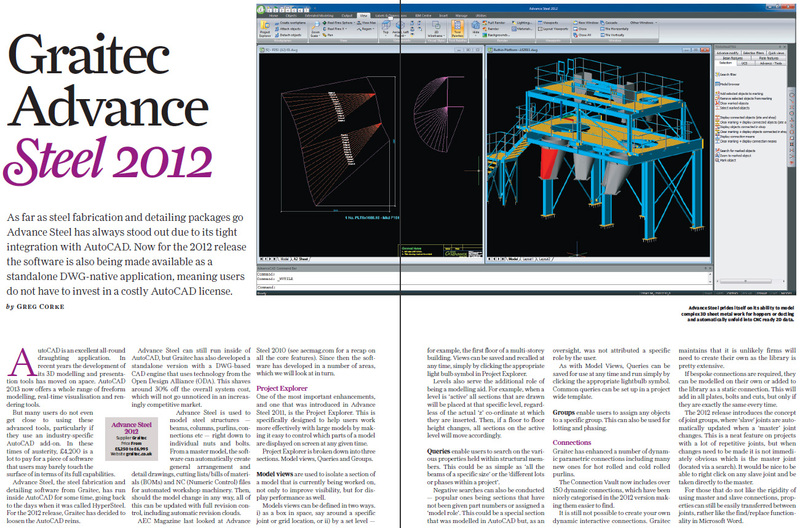 The June edition features an extensive review of GRAITEC’s Advance Steel 2012® software. GRAITEC is a leading developer of CAE and CAD software technology, fully BIM enabled for the construction industry. Advance Steel® BIM system is specifically designed for structural engineers, steel detailers and fabricators who require a comprehensive yet user friendly 3D structural steel detailing software that automates the production of drawings, BOMs and NC files. Advance Steel 2012 is in a league of its own offering users the freedom to run with or without AutoCAD. ← Do you need to use Eurocodes and reduce project time?